We would love to handle all your dry cleaning and laundry needs. In addition to dry cleaning, we also provide fluff-and-fold laundry service, wedding dress preservation, comforter cleaning, drapery care, and much more! With same day service Monday through Saturday, we guarantee your garments will be ready by 5pm if they are dropped off by 10am. We also provide pick up and delivery service for bulk/corporate accounts upon request. We hope you take advantage of our new customer special below. 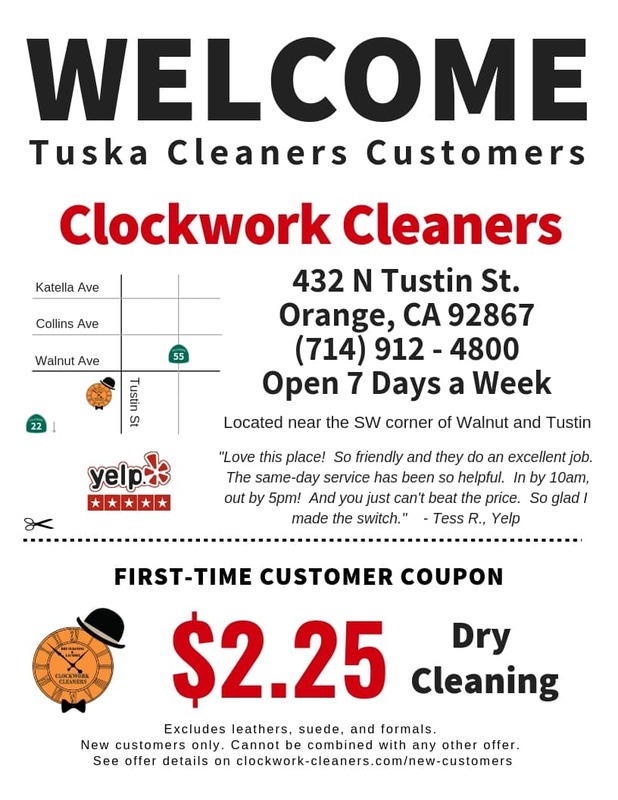 Enjoy dry cleaning at $2.25 per garment (regular price is $2.75), no limit! We do ask that our customers pre-pay at drop-off and charge a small convenience fee of $.50 for credit card transactions under $10. This deal cannot be combined with any other coupon or promotion. Offer expires 06/30/2019 and is only available for new customers. Excludes leathers, suede, and formal dresses.